Saturday, April 14th or Sunday, April 15th, 2018 – Attend a church of your choice. Monday, April 16th, 2018 – Official Opening of the “Week of the Young Child” celebrations, City Hall, Hamilton 10:00 a.m. Come out and enjoy the musical selections by children from various schools. Tuesday, April 17th, 2018 – Be Fit Tuesday – Encourage Healthy eating and fitness at home and school. Thursday, April 19th, 2018 – Artsy Thursday – On Artsy Thursday, celebrate the joy and learning children experience when engaged in creative art making. 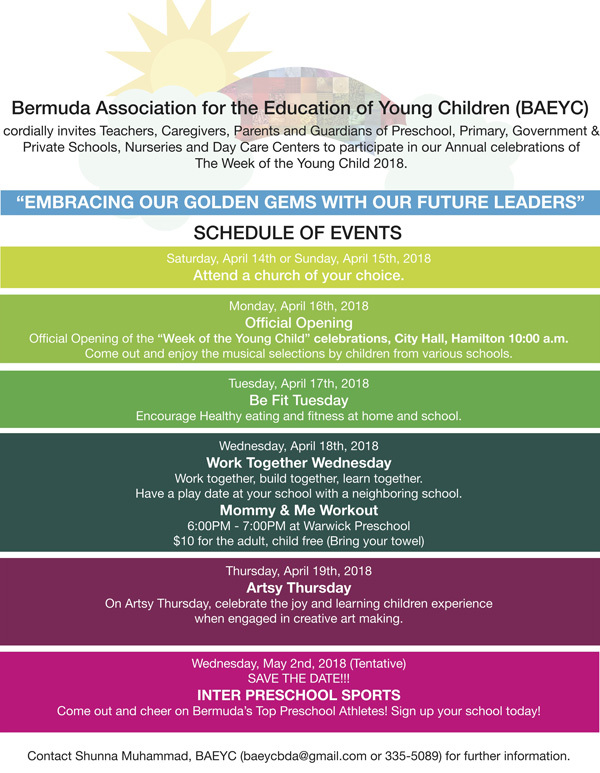 Wednesday, May 2nd, 2018 [Tentative] – Inter Preschool Sports – Come out and cheer on Bermuda’s Top Preschool Athletes! Sign up your school today! Contact Shunna Muhammad, BAEYC [baeycbda@gmail.com or 335-5089] for further information.